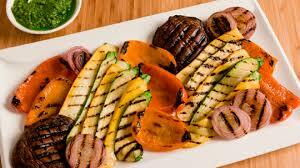 Red Onion, Red Pepper, Zucchini, Yellow Squash and blanched Sweet Potatoes tossed in a balsamic marinade and grilled to perfection. Fancy Green Beans steamed and sautéed, topped with medley of grilled Red and Yellow peppers and drizzled with a balsamic glaze. A medley of White asparagus, broccoli florets, baby carrots lightly sautéed. Oblique cuts of Zucchini, Yellow Squash and Carrots julienned and sautéed with garlic and olive oil and delicately seasoned. 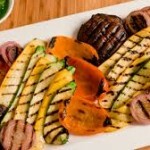 Zucchini, Yellow Squash, sweet potato and Red Onions tossed in Italian dressing and balsamic vinegar and roasted to perfection. 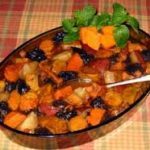 Classic holiday or special occasion of baby carrots glazed with brown sugar and orange juice. 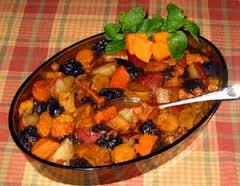 Braised sweet potato, carrots, onions and prunes (optional) with hint of cinnamon and honey. Fresh beets boiled diced and glazed in maple syrup. A mix of Broccoli, Onions, Cauliflower and carrots made in a kugel style using an individual tart shell per portion.